We pride ourselves on the fact that we work with the majority of commercial construction and roofing companies here in Wellington and offer the full commercial range of continuous spouting and commercial spouting solutions. THREE65 has the only 125 Box Gutter machine in the lower North Island and can custom run lengths. 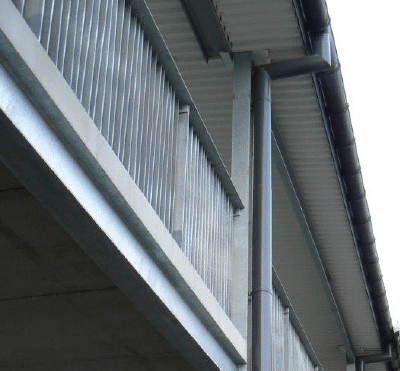 Recognised for our ability to provide 80 to 200mm Colorsteel® downpipes and custom commercial spouting there’s no commercial rainwater products we can’t manufacture and install. Don’t forget to consider installing low maintenance Colorsteel® fascia to commercial buildings. See our range of facia profiles. We also repair existing spouting, both PVC and steel, so if you have annoying leaks, or require some spouting repairs, give us a call. Our most widely used commercial spouting profile. Manufactured here in Wellington, ensures a quick order and turnaround. Also suitable on residential houses. This large capacity industrial spouting has a cross sectional capacity of 12,000mm2 and installed using our custom laser cut. Aluminium brackets provides a superior look to any commercial project. A truly commercial spouting profile that has the capacity to cope with large roof areas. Due to its size we recommend use only with external brackets so as to increase durability. This is the largest standard commercial profile that we do, with massive capacity this pro le is best suited to large run roofs or where you have a lack of downpipes. From PVC to COLORSTEEL® we do the full range right up to 200mm COLORSTEEL®. We have also manufactured downpipes in stainless Steel and hot dip galvanised finish with custom bends.